This beautiful light dressing enjoys the sharp flavours of sour apple and blue cheese. Place the almonds in a non-stick fry pan and brown slightly at a medium-low heat. Remove from stove and set aside. Cut the 1/2 apple in 4 lengthwise. Then slice each wedge thinly. Place the spinach and red onion in a large salad bowl and toss with the vinaigrette. Top with the cheese, apple and almonds and serve immediately. 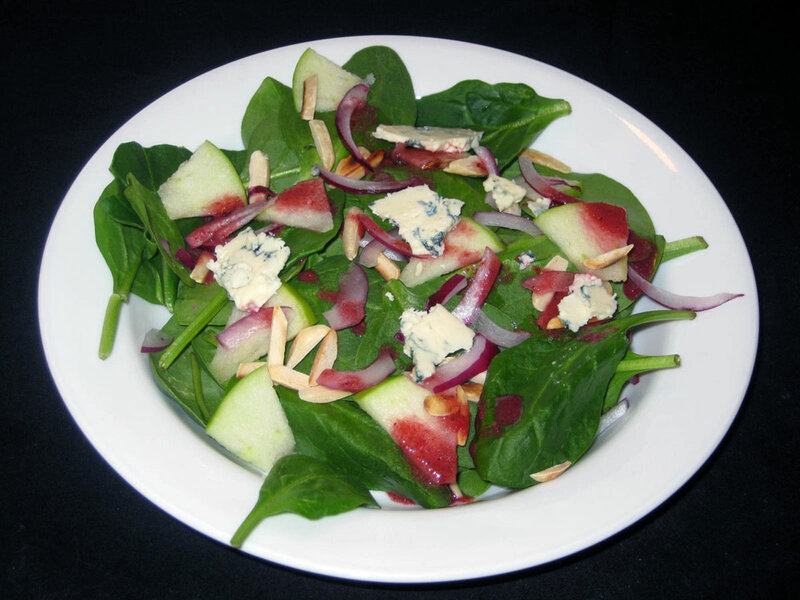 To prepare individual dishes layer all the ingredients (spinach, red onion, apple, blue cheese and almonds) in 4 bowls. Then drizzle each with 1 - 2 tablespoons of Cranberry Vinaigrette. Feta cheese can easily and deliciously be substituted for blue cheese. Join our mailing list to receive the latest news and timly recipies. ©2019 Snell House Foods · Designed & Built by Ian Sterne Design.